As previously rumored Apple released their new Macbook Air line-up today featuring Intel Sandy-Bridge processors, a Thunderbolt high speed I/O port, flash storage, a backlit keyboard and a high-resolution 16:9 wide aspect ratio LED-backlit display. The base model features an 11-inch screen with a 1.6 GHz dual-core Intel Core i5 processor, 2GB memory, integrated Intel HD Graphics 3000 processor , backlit keyboard and 64GB of flash storage for $949. 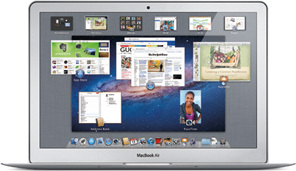 The price is $50 cheaper than last years base model Macbook Air.